Migration has been a part of the human experience since the dawn of time, and populations have always moved in search of resources and better conditions. Today, unaccompanied children and youth are an integral part of national and global migration patterns, often leaving their place of origin due to violence, conflict, abuse, or other rights violations, or simply to seek better opportunities for themselves. It is estimated that 33 million (or some 16 percent) of the total migrant population today is younger than age 20. Child and adolescent migrants make up a significant proportion of the total population of migrants in Africa (28 percent), Asia (21 percent), Oceania (11 percent), Europe (11 percent), and the Americas (10 percent). The issue of migration is central to the current political debate as well as to the development discussion, especially in conversations about the “post 2015” agenda. Though many organizations are working to improve children’s well-being in their home communities, prevention work with children and youth is not likely to end migration. Civil society organizations, together with children and youth, government, community members, and other stakeholders can help make migration safer and more productive for those young people who do end up on the move. As the debate around migration rages, access to and use of ICTs is expanding exponentially around the globe. For this reason Plan International USA and the Oak Foundation felt it was an opportune time to take stock of the ways that ICTs are being used in the child and youth migration process. how civil society organizations are using ICTs to facilitate and manage their work; to support children and youth on the move; and to communicate and advocate for the rights of child and youth migrants. Ways that CSOs are using ICTs in their work with child and youth migrants. Though we were able to identify some major trends in how children and youth themselves use ICTs and how organizations are experimenting with ICTs in programming, we found little information on the impact that ICTs and ICT-enabled programs and services have on migrating children and youth, whether positive or negative. Most CSO practitioners that we talked with said that they had very little awareness of how other organizations or initiatives similar to their own were using ICTs. Most also said they did not know where to find orientation or guidance on good practice in the use of ICTs in child-centered programming, ICTs in protection work (aside from protecting children from online risks), or use of ICTs in work with children and young people at various stages of migration. Most CSO practitioners we spoke with were interested in learning more, sharing experiences, and improving their capacities to use ICTs in their work. Based on Plan Finland’s “ICT-Enabled Development Guide” (authored by Hannah Beardon), the Modern Mobility report provides CSOs with a checklist to support thinking around the strategic use of ICTs in general. 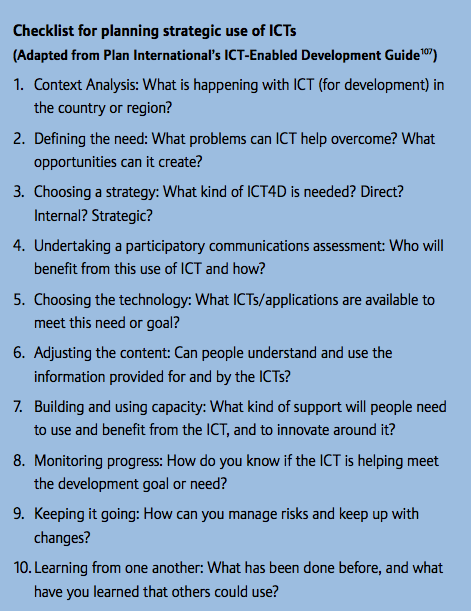 ICT-enabled development checklist developed by Hannah Beardon for Plan International. We also offer a list of key considerations for practitioners who wish to incorporate new technologies into their work, including core questions to ask about access, age, capacity, conflict, connectivity, cost, disability, economic status, electricity, existing information ecosystems, gender, information literacy, language, literacy, power, protection, privacy, sustainability, and user-involvement. Establishing an active community of practice on ICTs and children and youth on the move. 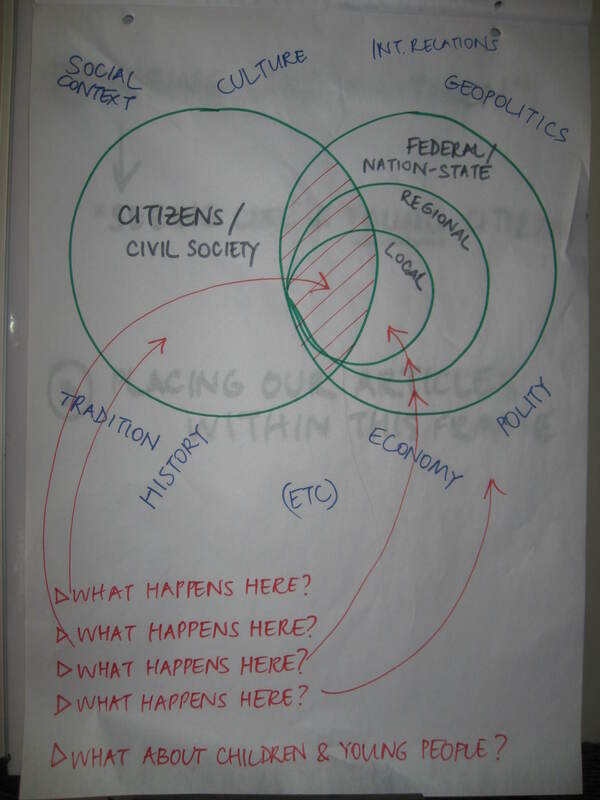 Mapping and sharing existing projects and programs. 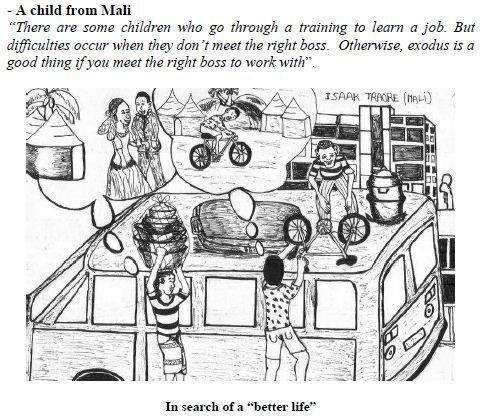 Creating a guide or toolbox on good practice for ICTs in work with children and youth on the move. Further providing guidance on how ICTs can help “normal” programs to reach out to and include children and youth on the move. Further documentation and development of an evidence base. Sharing and distributing this report for discussion and action. Download the Modern Mobility report here. We’d love comments and feedback, and information about examples or documentation/evidence that we did not come across while writing the report! As part of their efforts to reduce violence against children, Plan Benin is rallying motorcycle-taxi drivers to use SMS to report violence against children that they witness in the streets. The Zemidjan or “Zem” swarm the streets of Cotonou like bees. They are everywhere; silent observers to all comings and goings. Now, they have received training on how to recognize cases of child trafficking or kidnapping which often occur on the same busy streets. Using SMS texting on their mobile phones, they send information which is tracked and mapped by Plan using Ushahidi, an open source web-based technology platform. Plan then alerts authorities through partnerships with the Benin Central Office of Child Protection and ministries of Family, of Home Affairs and of Justice who begin the process of retrieving the children or investigating the abuse. The Zem join youth, heads of police squads, community and religious leaders and others who have received the training on how to recognize abuse and report it through simple SMS from Plan. Plan promotes a phone number that is used to collect the SMS on billboards and radio programmes. This is the kind of innovation I think is most interesting – identifying existing networks and systems, and seeing how to enhance or expand them via new technologies. I’m looking forward to seeing how the program advances, and what Plan Benin learns from this effort to engage broader networks in preventing, tracking and responding to violence against children. 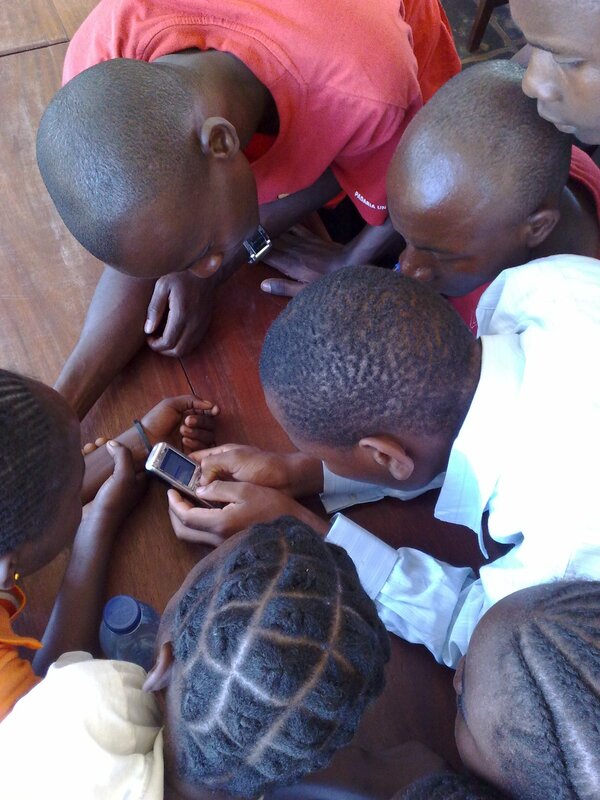 The team in Benin has created a video about the violence reporting system, which uses both FrontlineSMS and Ushahidi. The technology tools, however, are only part of the program. In addition, the team launched billboard and community radio campaigns to promote the violence-reporting number; engaged local communities, government, child protection agents, and NGOs; and trained children, families, teachers, school directors, parents and community leaders (and now moto-taxi drivers!) about violence, its impact on children and how to respond to it. Children and young people have been involved in program design and implementation as well, and there have been thorough discussions on how to manage this type of sensitive information in a private and secure way. For some older posts that demonstrate the evolution of the project, which started off in early 2010, click here. Why should you be holding a computer mouse? This is the type of taunt a girl might hear when trying to sit in front of one of the computers at the school’s lab, said Fabiola, a young woman from Cameroon while speaking on a panel about girls, education, and new technologies at the 55th Session of the Commission on the Status of Women (CSW). Fabiola was invited to the CSW to speak about her personal experiences as a girl studying a career in Science, Technology, Engineering and Math (STEM). Fabiola went on to share how her parents had been instrumental in encouraging her to pursue her studies, even though she was one of few girls who decided to go down the STEM path. Unless you’ve been living under a rock, you’ll be quite aware that there has been an increasing emphasis in the development sector on girls and ICTs over the past few years. Everyone from large government donors to NGOs to the private sector is banking on girls and technologies, especially mobile phones, to play a big role in helping resolve poverty and make development gains. Girls themselves consider ICTs to be a major element in their personal growth and development, useful for improving studies, staying informed and earning a living. Girls say that ICTs help them reduce their sense of isolation, acquire new skills, actively participate in national and global dialogues, learn about taboo subjects (such as reproductive health and HIV), feel safer and more in touch with family and friends, and strengthen self-esteem. They often credit participatory media and technology programs with helping them improve their ability to express themselves, speak in public, and to dialogue with adults and other decision makers to negotiate their needs and rights. 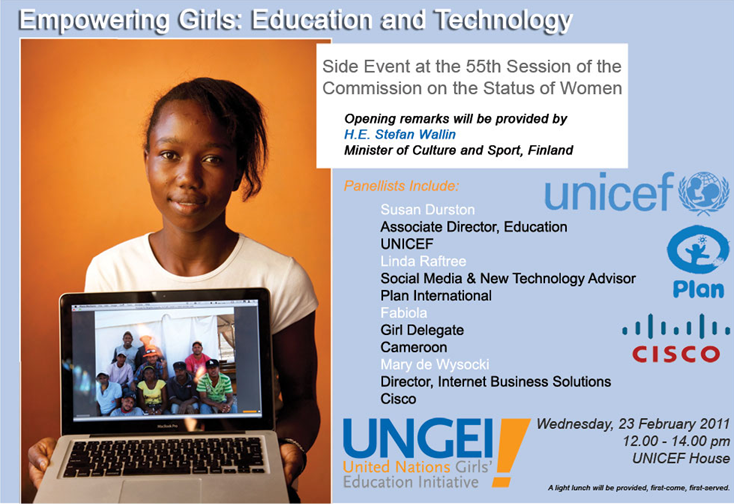 The flip side is that for many girls, access to and use of ICTs is a huge challenge. Gender discrimination, lack of confidence, not speaking a major language, low literacy, lack of time and money, and restricted mobility (due to cultural factors or safety) often prevent girls from taking advantage of the benefits of ICTs. Despite the positive trend in mobile phone and Internet access worldwide, access is often characterized in terms of broad economics, eg., ‘developing’ vs ‘developed’ countries, or it is analyzed at the country level: eg., Kenya vs Mozambique. Analysis needs to go much deeper, however, to include individual factors like class and wealth status, gender, geographic location, age, disability, literacy, language, and device ownership. Girls living in the same geographic area may have very different levels of access. An English-speaking Kenyan girl living in an urban high rise with her upper class parents will have more access to ICTs than a non-English speaking Kenyan girl with low literacy levels who works long hours cleaning that same apartment and lives in a slum area nearby. The mobile phone ownership capacity of the daughter of a relatively wealthy community leader who owns a small local business will be greater than that of the daughter of one of the poorest families in the same village. Gender discrimination also comes into play, and in places where men and boys dominate women and girls, they also tend to dominate the available ICTs. In places where boys are more favored, their confidence to try new things will tend to be higher. Girls often report that boys hog and monopolize ICT equipment and that they criticize, scorn and ridicule girls who are using equipment for the first time, making girls feel too timid to try again. 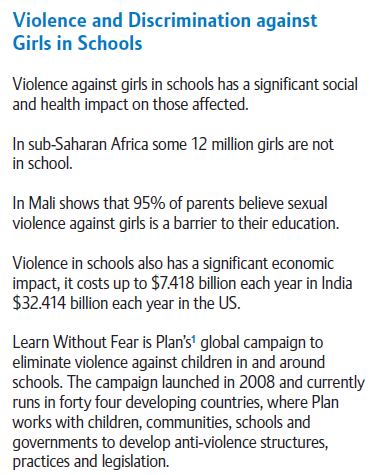 How can development agencies help girls overcome these barriers? If girls and women continue to live in greater poverty, with lower education levels, less access to healthcare and other services, less opportunity to work, and lower status in their societies, chances are that their access to and use of ICTs will not level out to that of boys and men. Getting more girls into school and improving the quality of education could help more girls access and learn to use ICTs. Finding ways to encourage critical thinking and innovation within the education system and ways for girls to join in extra-curricular activities to stimulate new ways of thinking might also help more girls to build the skills and mindsets necessary to enter into the growing number of jobs in the ICT sector. Advocating for and supporting policies that make Internet more accessible and affordable overall is another area where INGOs can play a role. Libraries and other safe spaces can also help girls and women feel more comfortable and able to access information and learn how to use ICTs. A shift in thinking is needed in order to stimulate behavior change that is more conducive to girls participating fully in their family and communities as well as at broader levels. Girls need to be seen as people who can and should take advantage of the potential of ICTs, but they cannot create this shift in thinking on their own. Broad and deep legal, attitudinal and behavior changes need to happen in families, communities, institutions and society in general. Organizations should engage men and boys as allies in this process. When fathers and male peers are aware, engaged and supportive of girls’ development and girls’ rights, they play a very strong role in changing broader norms and perceptions. Female role models can also help change mentalities. Having a device or new technology in their possession can increase the status and strength of girls and women as role models and enable them to carry out different and important roles in the community. In the short-term, offering specific and accompanied support and opportunities for girls to access and take advantage of ICTs can help fill some of the gaps mentioned above. ICTs can be incredible tools for engaging students in the classroom, making teaching methodologies more participatory, encouraging student-led research and building critical media and digital literacy skills in the process. In places where textbooks are old and outdated, the Internet can offer ways to connect with current events and up-to-date research. Adding gadgets to the classroom experience involves more than just having the latest digital devices; however, and careful thought needs to be given to the teaching goals, desired outcomes, and issues like relevance and sustainability before deciding on tools and devices. Special care needs to be taken to ensure that in these controlled spaces, girls have equal access to equipment. Where ICTs cannot be integrated into the classroom or where girls are not in school, non-formal education and extra-curricular activities can give girls a chance to interact with ICTs.